$9/DZ or $1.50/dz for 10 dozen or more. 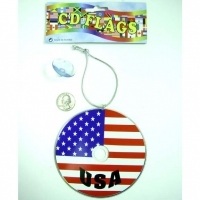 AMERICAN FLAG PRINT WITH STARS AND STRIPES ON A CD THAT YOU CAN HANG FROM SOMETHING, COMES WITHA SUCTION CUP . This product was added to our catalog on Saturday 17 September, 2011.